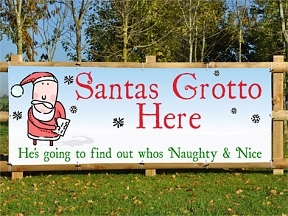 PVC banners are a great way to advertise around the festive period. 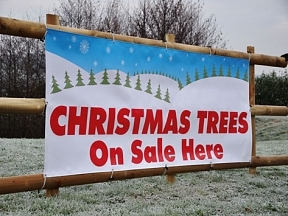 Do you need a PVC banner to advertise your Christmas trees or maybe you are advertising a Christmas fayre coming up? Want to draw in the crowds this New Year? 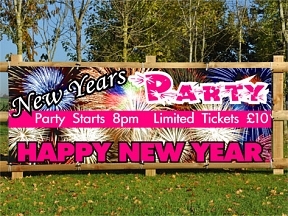 Advertise your New Year offers with a PVC banner. 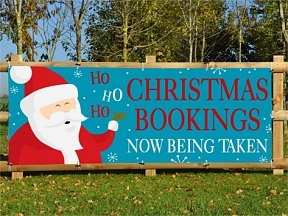 Christmas banners are a great cost effective way to promote any seasonal or Christmas event. All Christmas Banners and New Year Banners can be modified or re-designed to suit your needs, all at no extra cost! Christmas is a busy time of year for several businesses, with pubs, restaurants, hotels, garden centres and shops among those who will hope to have the tills ringing all the way through to the New Year. All of the above successfully use PVC banners to advertise their products and services, with this proving to be a cost effective of getting the marketing message across. 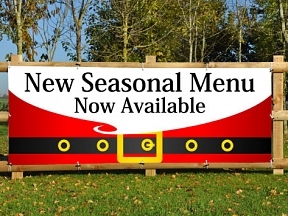 Whether it’s a Christmas Day menu, a Christmas fayre taking place or brilliant Christmas present ideas, using a PVC banner to passing trade regularly sees a return on a small investment, with a free design service available so that customers can tailor their advertising message accordingly. New Year banners are also available and there are ready-made designs available for both Christmas and New Year display items, with customers having the choice to select something off-the-shelf or alternatively create their own banner design. Naturally, the friendly HFE staff are on hand to help you get the look and feel right before processing the order and getting the banners sent out. Christmas and New Year banners can be used on an annual basis, with the materials high quality and designed for outdoor use.